Breaking away from a group practice or clinic to start your own is an exciting new adventure. 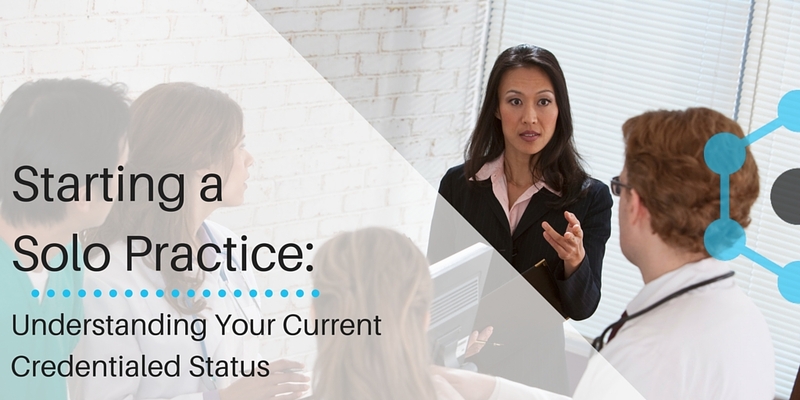 But one important step you must take before you can open your practice’s doors is understanding your current credentialing status. To understand your status you’ll need to speak with your previous group practice, set aside ample time to get organized, and conduct some research about insurance options in your area. The first thing you should do after breaking away from a group practice is clarify how you were credentialed with them. Some practices individually credential each of their counselors while others credential as a group. Don’t assume your status—discover how you were credentialed with your old practice before you spend time and money on re-credentialing. If your old practice credentialed each counselor individually, you simply need to change your billing address and practice name with the insurance company. However, if you were credentialed under your practice’s contract, you’ll need to be re-credentialed before any of your claims will be accepted. By asking instead of assuming about your credentialing status, you’ll put yourself in a better position to understand your current credentialing needs. Give yourself time to get organized. Whether you’re re-credentialing or just changing your individual information, set aside a few hours to organize your credentialing information. If your previous group practice credentialed with an employee contract you’ll need to begin the credentialing process from the ground up, and the first thing to understand when getting credentialed on your own is the time commitment you’ll have to make. Credentialing is a long process that requires at least 10 hours for developing your application and up to 180 days for it to be properly reviewed. Give yourself plenty of time to complete this process before you begin seeing patients and billing insurances. Claims filed while you’re still in the credentialing process will be denied, and you’ll be responsible for covering the costs of patient care. Your current credentialing status will determine how much time you’ll need to set aside before you can begin seeing patients. The last step in your credentialing endeavor is to complete research about insurance companies in your area. If your group practice individually credentialed you as a counselor, it will be beneficial to look into additional credentialing options for your current, or new, location. If you are starting the credentialing process from scratch, you’ll also need to research which insurance panels will be the most useful and beneficial for your new patients and area. Starting a solo practice comes with a lot of new administrative duties, and credentialing concerns should be a top priority if you’re looking to begin seeing patients as soon as possible. Determining your credentialing status will help you discover the insurance coverage options available to you and your future patients as you embark on your new journey.